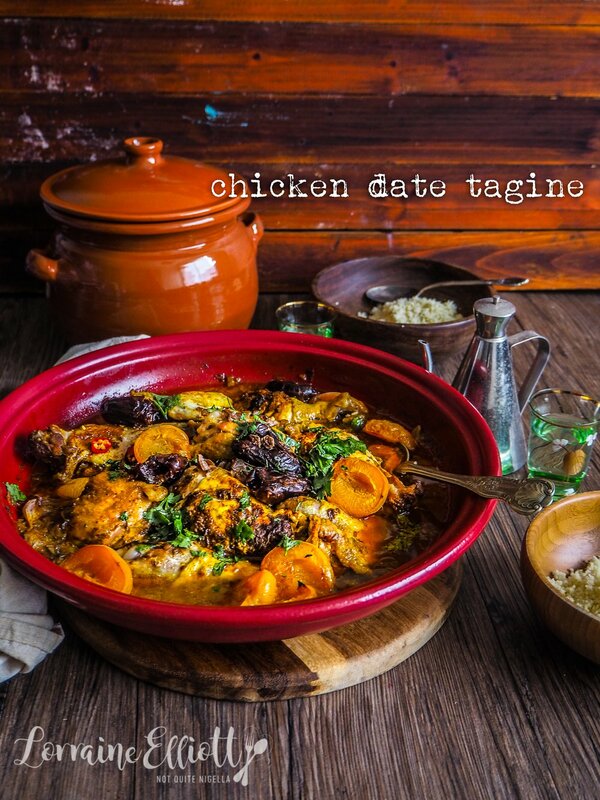 Date Night With Chicken, Date & Apricot Tagine! Tagines are one of the easiest ways to cook meat. The shape of the tagine and the funnel top acts as a way to trap moisture in the a dish producing an incredibly succulent meat. 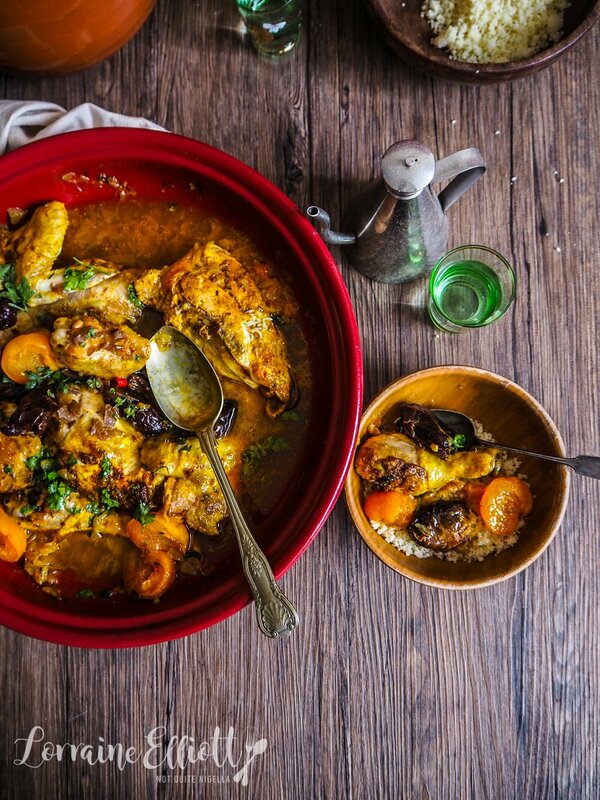 This recipe uses a whole chicken, cut into pieces with dates and apricots and served with fluffy couscous! And don't worry this also works with a lidded pot too. Dear Reader, I can't rave enough about this dish and it came at just the right juncture. 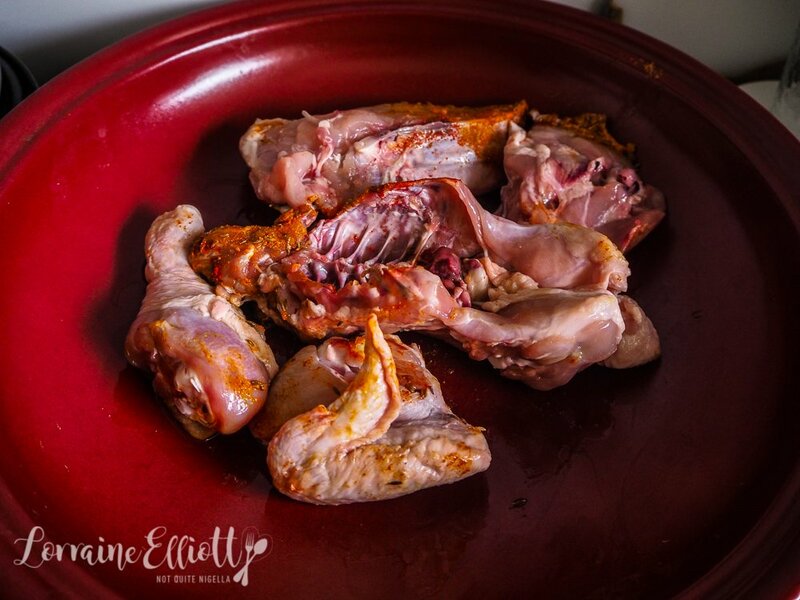 I love using a whole chicken rather than pieces because that way I get the skin on which is pretty much my favourite part of chicken. But of course feel free to use your favourite pieces skin on or off (but really, why don't you like chicken skin? Let's talk). 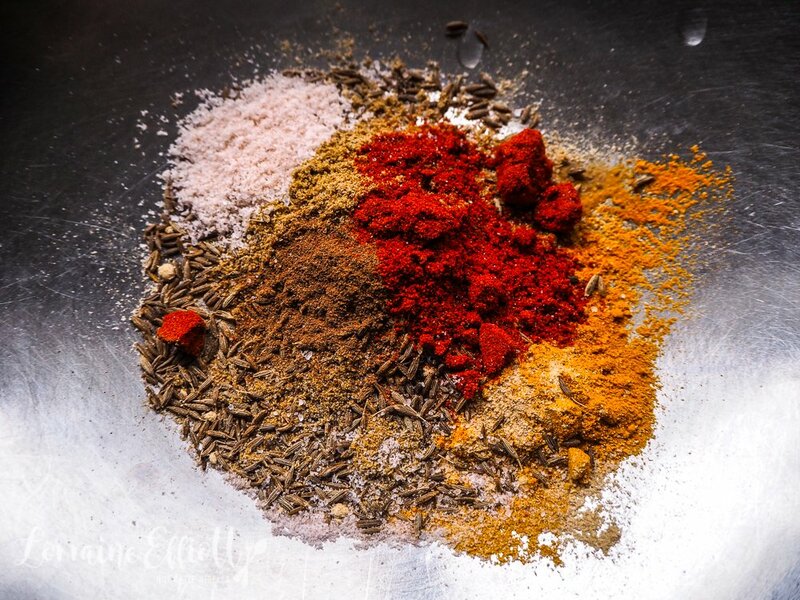 I made this on a particularly hectic day Dear Reader, one in which I had no time to marinate meat, no time to stand in front of a stove and no time to do anything really and I had chicken that needed using up. The reason why I had no time is because of the house's number one chicken fan Mochi. This past month Mochi has been having some health issues. Her breed (Maltese Shihtzu) are prone to certain health problems like luxating patella (floating knee cap), skin disorders, bad teeth, sensitive tummies and are also prone to Cushings. We knew about the rest but she now has been diagnosed with Cushings too. Cushings is a fairly common adrenal disorder (especially in small white fluffies) where her body produces too much cortisone. As a result she can be lethargic, thirsty and hungry with sparse fur. After the diagnosis we ordered some medication for her as it is treatable. Along with this she has had an upset tummy for the last week too. Whenever she looks panicked I rush her out of our apartment and usher her outside and that may be once every 15 minutes. Sometimes I missed her signals and that was very unfortunate. At the end of the second day all I could do was lie on the couch. I couldn't even bear the thought of going out. I just held my little puppy and stroked her and hoped that she was ok. And thankfully because this dish spends most of the time in the oven I had dinner because there was no way I could stand there and cook. 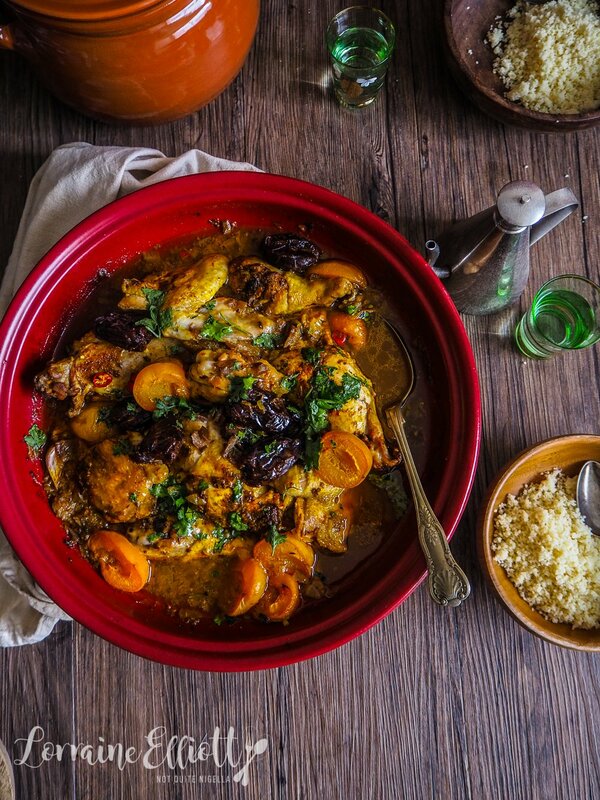 For this chicken tagine I used fresh apricots because they were quite early on in the season and weren't quite sweet enough and I think it added a balance to the sweet dates so this dish wasn't overly sweet and had a good balance. And although Mochi was sick, she begged for some of this too! So tell me Dear Reader, are you a skin off or on person? Are there days where you just cannot bear the idea of going out? Step 1 - Preheat oven to 190C/380F and place the oven rack on the lowest rung (so that it can fit your tagine or pot). Dice onions and mix the spices together in a bowl. Place salt and spices in a bowl or ziplock bag with chicken and shake all over to distribute. Step 2 - Heat the tagine or a cast iron pot on medium heat on the stovetop (electricity or gas is fine) and add oil. Brown the chicken skin side down and then put aside on a plate. Add more oil and saute the onion. Add the garlic cloves and a bit of the chicken stock and deglaze the tagine or pot. 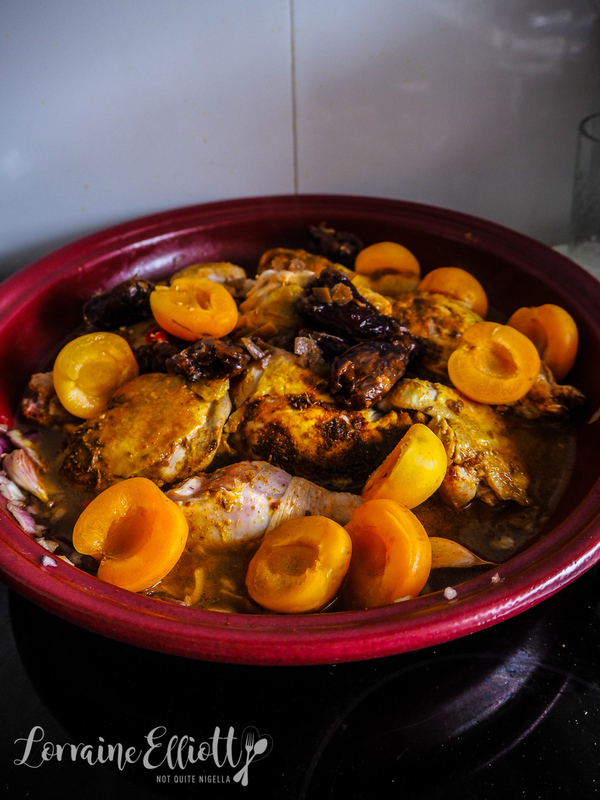 Step 3 - Place the chicken pieces back in the tagine skin side up and add the remaining stock, dates and apricots. Place the lid on the tagine or pot and bake in the oven lid on for 1 hour. 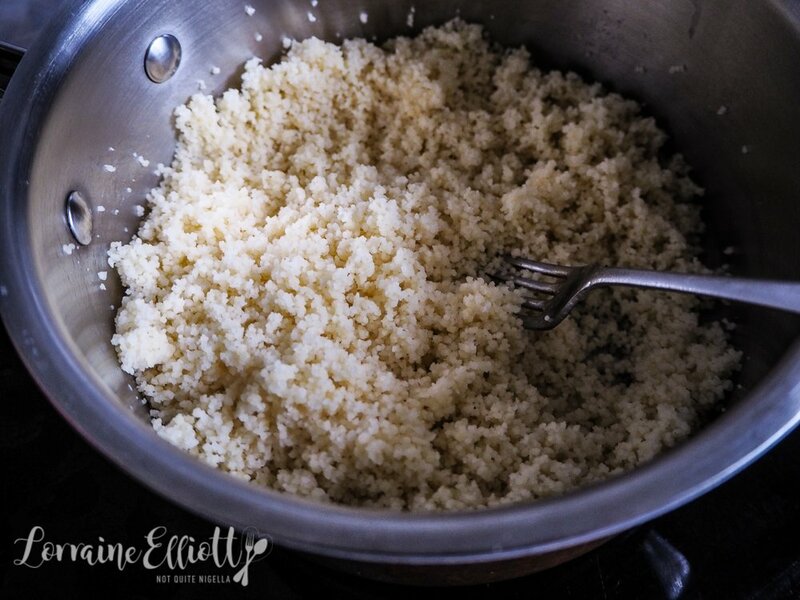 Sprinkle with coriander and serve with couscous. Step 4 - To make couscous-start it 10 minutes before the chicken has finished. Bring the stock to a boil and add the couscous in a steady stream making sure that it is submerged in the water. Take off the heat and place lid on and allow to steam for 7 minutes. Fluff with a fork.